This luxurious rental villa is in a very special location, surrounded by the well-preserved ancient city walls in the Istrian town of Novigrad. It is a central, but quiet location, directly facing the sea. The covered terrace has a heated indoor swimming pool and sauna, separated from the outdoor terracel by retractable glass windows, enabling guests to use the pool throughout the whole year, regardless of the weather. There is an outdoor kitchen and dining area on the outdoor part of the terrace. The special “yacht design” of the villa is impressive. There are wonderful views from every window, and the spacious living room gives the feeling of being spectacularly suspended over the sea. 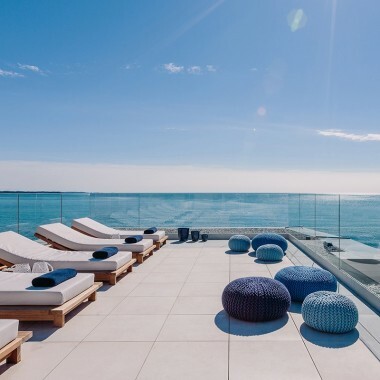 The three large terraces are ideal for sun bathing, with the rooftop terrace offering unrestricted 360 degrees panoramic views over the Adriatic Sea and the picturesque town of Novigrad. Being in the centre, it is just a few minutes away from local shops, restaurants and bars. Amenities at the villa include Wi-Fi internet access, a mobile phone, air-conditioning, LCD Satellite TV in every room and a Bose surround sound system. There are five car parking spaces at the villa and an alarm system at the property. Novigrad not only has a rich cultural heritage and preserved natural beauty, but also it is an architectural jewel filled with evidence of its past history. Novigrad is also one of the top Istrian gourmet destinations. 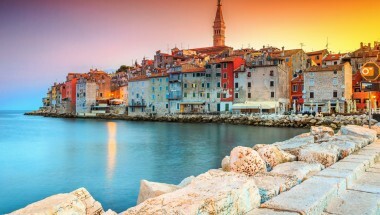 A series of culinary events are held in Novigrad throughout the summer months where visitors can try traditional dishes made from scallops and other Adriatic shellfish as well as indigenous istrian specialities such as Prosciutto (dried Istrian ham) and the world famous Istrian Extra Virgin Olive Oil. This luxury villa to rent in Novigrad, Istria, is in a unique location, directly facing the sea, and surrounded by the well-preserved ancient city walls of the town. It combines the advantages of a heated pool, sea views and proximity to the historic town of Novigrad. Outside high season, the villa can be rented for shortly stays for a nightly rate - please check with us.